Hana Crawford ('14) will join the New Mexico State Office of Historic Preservation and the Historic Santa Fe Foundation for a co-sponsored internship this fall. She will conduct video oral history interviews on the State Income Tax Credit for Registered Cultural Properties program and document institutional memory with former board members of the Historic Santa Fe Foundation. Shannon Geis is the new editor for the Ditmas Park Corner and Kensington BK news blogs covering local news in Brooklyn. Kristin La Follette will be starting the MFA playwriting program at San Francisco State University in the fall, and continuing to teach. Her course load this semester includes the oral history service learning class at California State University, Monterey Bay. In addition, she is leading—with Ellen Brooks and Erica Fugger—a mentorship program for the Oral History Association. To learn more about the program, or to sign up as a mentor or mentee for the 2015 OHA conference, contact Ellen Brooks or Stephen Sloan of the OHA Mentorship Committee. Since January of 2015, Kyana Moghadam has been working as an independent oral historian, working on a project basis with individuals, families, community projects, and non-profit organizations. In September 2015, she will begin an archive internship with Democracy Now! in New York City. Marie Scatena is helping to organize a Groundswell: Oral History for Social Change Local Gathering Group in Chicago. The next meeting will take place on September 15 from 2 - 4 pm. Margaret Fraser will talk about how she crafted her project with New York Taxi Drivers, and will share her insights about the first Groundswell in New York, and Rosalie Riegle will share a bit about about the OHA resolution, and facilitate a discussion about Alexander Freund's 'Under Storytelling's Spell? Oral History in a Neo-Liberal Age.' Email Marie for more information. Allison Tracy started as the Oral History Administrator for the Kentucky Historical Society (KHS) and Kentucky Oral History Commission (KOHC) in July. She’ll be educating folks from across Kentucky on oral history, overseeing grants given by the KOHC, and working with KHS/KOHC oral history collections. In a couple of weeks Erica Wrightson ('15) will start work as the managing editor of publications at the Los Angeles County Museum of Art (LACMA). She is also contributing a (soon to debut) regular oral history column to an L.A. Times op-ed blog about neighborhood development. Liza Zapol is teaching Oral History Methods at the New School for Drama this fall, a synthesis of her performance, documentary production, and oral history interests. She has completed another year of consulting with the NYC-based Greenwich Village Society for Historic Preservation on an oral history project on the South Village and the East Village, which will host public events to celebrate its oral history collection this fall (stay tuned)! She continues to work with the Whitney Museum, helping to create dynamic stories about the views from the new building. She has also been creating an Oral History of the Whitney’s Independent Study Program. In addition, she is engaged in consulting on oral history projects with individual artists. On the creative front, she has been involved in a year long residency with iLand and LMCC on embodied mapping, and is looking forward to more creative engagements with oral history. Nicki Berger: The TILL Living Legacy Project, which I developed with Toward Independent Living and Learning, an agency serving people with intellectual disabilities in Massachusetts, won the 2015 Provider's Council Innovator of the Year Award from the Massachusetts Council of Human Service Providers. For this project, I conducted oral histories with residents of community-based group homes and their family members, using interview material and family photos to produce a video and curriculum which has been implemented as a training tool for all TILL staff, and presented to hundreds of human services professionals in Massachusetts. I am currently piloting a Do-It-Yourself phase of the project, training staff who work in TILL's group homes to conduct oral history interviews with residents and their families. For the past year, I have been working on a project with Temple University's Institute on Disabilities: Visionary Voices, an oral history of the intellectual disability rights movement in Pennsylvania. Temple got a grant from Pew Arts and Heritage Trust to develop extensive community engagement programming out of the broader oral history project, and I have been the oral historian on a small team working on one of the more involved projects, entitled Here: Stories from Selinsgrove and Kencrest. For this project, I trained a group of 18 volunteers to interview individuals with intellectual disabilities who are living or working in segregated settings in Pennsylvania. We led the volunteers on two trips to Selinsgrove, a state-run institution still in operation, and KenCrest, a sheltered workshop and day program outside of Philadelphia, where they met, had lunch with, took field recordings with, and interviewed narrators with intellectual disabilities, and returned several weeks later to review interview materials together. We worked with a photographer, JJ Tiziou, to do self-portraits with the narrators. I am currently curating these materials for an exhibit which will open in the rotunda of the Pennsylvania State Capitol building on October 19th, and be in City Hall in Philadelphia for two months next spring. The exhibit will include an audio slideshow of interview excerpts and images, shown in a listening booth we're hoping will offer a contemplative space for listeners to encounter voices that might challenge them to listen differently. The edited excerpts, photos, and full interviews will all be available online in October, and I'll be sure to share links then. I'm continuing to pursue teaching opportunities. I taught a session at Oral History Summer School in June, on Mixed Ability Interviewing, and supported students in conducting interviews with narrators who live in Camphill, a mixed-ability community in Hudson. I will be teaching part of a semester of writing at the New School for Drama in Fall 2015. I have been facilitating lots of discussion internally at StoryCorps about accessibility and reframing how we think of or approach work around disability. The production team there interviewed me recently for their podcast marking the 25th anniversary of the ADA - you can hear me after the third segment here, if you want to listen (scroll down to StoryCorps 434: Listen Closely). I also have the great pleasure of audit-editing transcripts for the Robert Rauschenberg Oral History Project. Allison Corbett: Since graduating from OHMA in February, I have begun working again as a Spanish interpreter, and am working full-time at Mount Sinai, dividing my time between the St. Luke's and Roosevelt hospital locations. Additionally, I am in the midst of several projects: I am collaborating with a group of Washington Heights artists and Colectivo Amaranta on a series of "talking murals" that are based on and utilize audio from interviews completed to honor local residents. The project is inspired and supported by the NYPL Bridging Our Stories Washington Heights and Inwood Oral History Project, which will archive our interviews. As an active member of the volunteer collective that runs Word Up Community Bookshop in Washington Heights, I will be taking over coordinating the Word Up Oral History Project started by recent OHMA grad Benji De La Piedra for his 2014-2015 Fieldwork project, where we will record the history of collective, from its beginnings as a pop-up to its current day evolution as an independent bookstore and community space. We hope to offer workshops to volunteers this year in order to train them as interviewers, incorporate the use of oral history within the collective's organizational processes, and create mini-audio installations throughout the store using QR codes. Additionally I am continuing to work as a co-founding member of the Oral History Collective, as we develop ourselves as a community of oral historians interested in nurturing collaborative creative processes as well as sustainable self-employment within the field. In October 2015, I will present on the "Generational Activism: Postmemory and Social Justice" panel along with fellow OHMA alum Anna Kaplan about my OHMA thesis work: "Failure to Materialize: An Oral History of Puente de Fierro" about memorial politics in Argentina. Another project in collaboration with a long-time NY organizer regarding squatter movements on the UWS in the early 1970s is also in its nascent stages. Erica Fugger ('13): This past year has been an incredible learning experience. After completing my coursework in OHMA, I had the great fortune of managing Columbia's Oral History Archives, which put me in close contact with the 2013-2014 cohort. A number of collaborative spaces arose on campus last spring, such as the Columbia Oral History Alumni Association (COHAA) and Oral History Collective. Both groups seek to create support networks, generate professional development opportunities, forge inclusiveness, and innovate the field of oral history. These organizations have incredibly enriched my life, and contribute to the awareness and accountability my work intends to undertake. With the encouragement of my colleagues, it was a smooth transition into working more closely with OHMA as the Administrative Coordinator of the Interdisciplinary Center for Innovative Theory and Empirics (INCITE) last fall. Through the Oral History Association's Mentorship Committee and COHAA's Mentoring Program, we have provided new opportunities to empower aspiring oral historians. 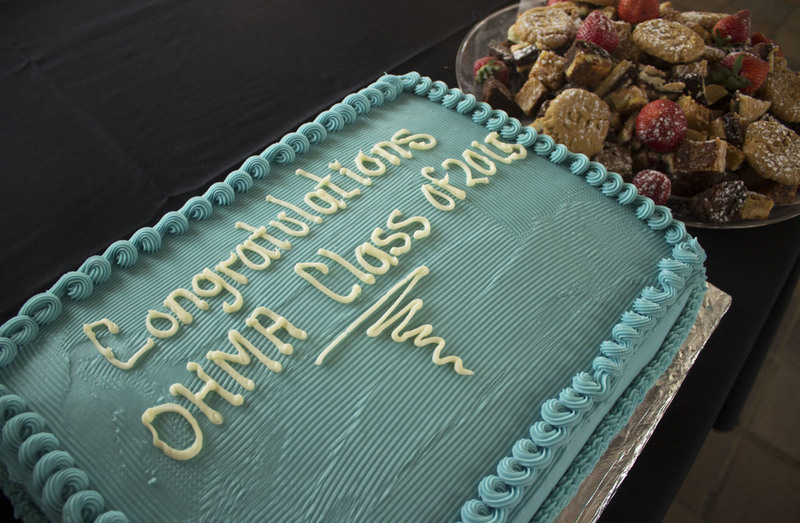 I have witnessed OHMA transform greatly over three years as a result of the hard work of faculty and students alike. This summer, I was given the honor of co-creating the Wake Up Oral History Project, an initiative documenting the experiences of young mindfulness practitioners in the Plum Village tradition. This project followed up on my OHMA thesis, "Listening Deeply: An Oral History of the Riverside Sangha," which drew upon interviews from a local New York meditation group embodying the teachings of Vietnamese Zen Master Thích Nhất Hạnh. The project began through interviews across five countries in Europe and culminated by teaching oral history methods to Wake Up groups in three North American cities. We are now applying for a grant to generate a website to host the interviews and drafting a guide to oral history through mindfulness practice. I am much indebted to my friends at Wake Up International who hosted me the past three months and shared deeply from their hearts. Much gratitude to my mentors at INCITE and the Columbia Center for Oral History Research, who provided me funding through an Atlantic Philanthropies Research Fellowship. I am excited to see what the next academic year will bring - the eighth cohort of OHMA already appears to be a diverse and engaged group! It it a pleasure to continue to work with and learn from Columbia oral historians in this capacity. Helen Gibb: Although I'm not quite an alum yet, I have just accepted a job offer to be a part-time oral historian with the Wisconsin Veterans Museum. I'll be doing interviews across the state and working with community groups. I'm finishing up my internship this week and will start the new position in September - looking forward to it! Lauren Taylor: I am deep into what I hope are the final revisions of two oral history book chapters - one in the social work domain, and the other straight oral history - as well as continuing my work in the therapeutic use of narrative (I'll be giving an all-day workshop on this topic for National Association of Social Workers, for CEU credits, in October). The oral history chapter is the culmination of a project at a senior center in East Harlem, where I have been interviewing members of the center about their lives growing up in East Harlem. The book of part of the Say It Forward series published by Voice of Witness. This coming week we will be holding a storytelling event in which the participants will share their stories with friends and family. We're hoping to help younger people who live in East Harlem get a picture of what life was like many years ago, and how the neighborhood has changed. The senior center has a relationship with a local elementary school, so we're working on developing a program to take into the schools, in which the older people will share their stories, and I will teach the kids how to interview their parents, grandparents, etc. The second chapter is for Columbia University Press, and is to be part of a social work textbook on using oral history in a therapeutic context. I am part of a working group of social workers using narrative in various aspects of our work (most of the others are from the narrative medicine program). My chapter will be on the therapeutic use of narrative with older adults, and I'm focusing on two clients with whom I used life review to help them recover from depression. Other than that, I continue working in a clinic for older adults four days a week, and have a private practice in which I use a lot of life story recording as a therapeutic tool. And of course, teaching at the social work school, which I continue to love. Whew! We’ll be sure to keep you posted on how all these projects evolve, so stay tuned and keep reading!